We are celebrating Langeudoc with The French Winophiles this month. This party is hosted by Jason and Jill over at L'Occasion. You can see their Preview Post here. This party came on the tail of our #Made in France event. You can read all about how this event came about in my Wine and Cheese post. 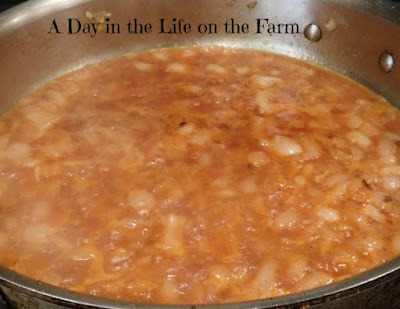 I also wrote about it in this post and then in this pairing with venison in which I linked to the posts that my fellow Winophiles had written. I had received a dozen wines from Whole Foods for the Made in France event. One of them was this bottle from Languedoc. I knew that we were celebrating this region later in the month so I set it aside to share with you now. While this wine was given to me as a sponsor gift for the purposes of the Made in Wine event all opinions voiced in this, and all my posts, are strictly mine. Since I already had the wine from this region chosen I needed only decide on the food pairing. I did some research and the dish that came up time and time again to represent the Languedoc area of France was Cassoulet. 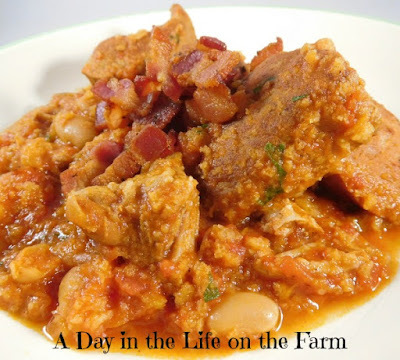 Cassoulet is a slow cooked stew originating in the south of France. Many versions contain duck. Some contain pork skin. 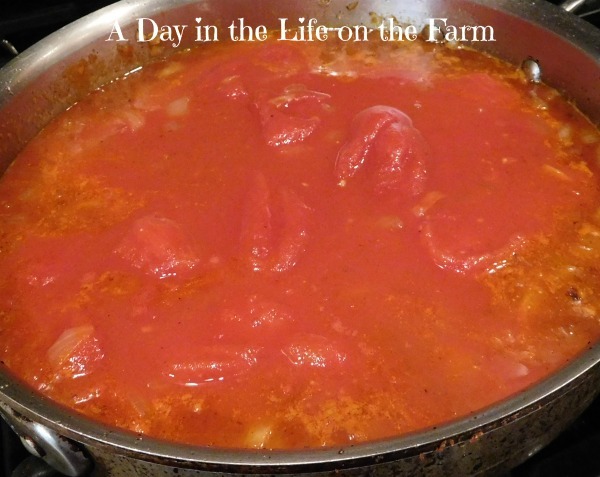 All contain white beans, meat and tomatoes. I wasn't making this dish during a long leisurely weekend when I had hours to spend creating this wonderfully rich stew. So I did what every busy person does when faced with this dilemma. I turned to my trusty slow cooker. It took me an hour to layer all the flavors but then once it was in the slow cooker I could walk away and not think about it again until dinner time. I cooked the bacon to a crisp and set it aside. Then I browned the country ribs in the bacon fat until they had a nice sear. Removed them from the pan and pulled up all the brown crispy bits stuck to the pan by deglazing with white wine. When that was reduced by half, I added the tomatoes and chicken broth and let that warm through and reduce a bit before putting everything into the slow cooker on low for 6-7 hrs. 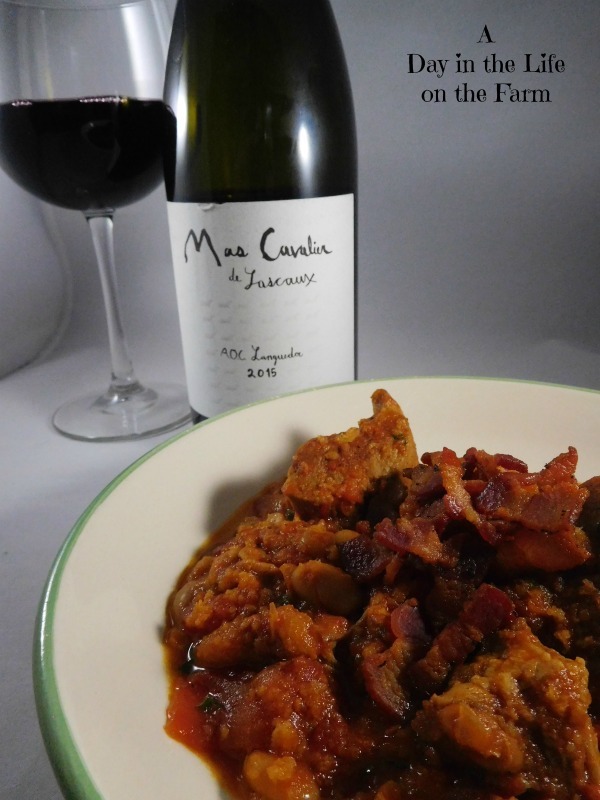 About a half an hour before we were ready to eat I pulled out the bottle of wine from Mas Cavalier de Lascaux. Frank opened the wine and poured while I put the finishing touches on dinner. This winery has been in the Cavalier family for 13 generations. It is nestled in the foothills of Cevennes. 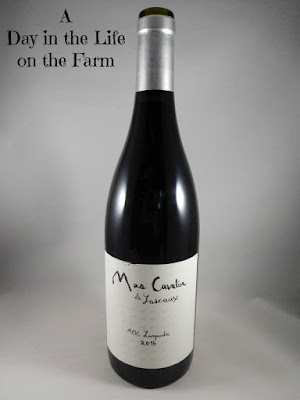 You can learn more about the winery and the wines it offers at their website. And what a wonderful dinner it was. We started off with the wine. We took a sip and were simply unimpressed. Often French wines are too soft for our palate that is used to the bolder, harsher new world wines. Then we had a bite of the stew and another sip of wine. Oh.....there it is...the light in the distance. Another bite and another sip and then we understood why the rule about wine and food from the same regions exists. 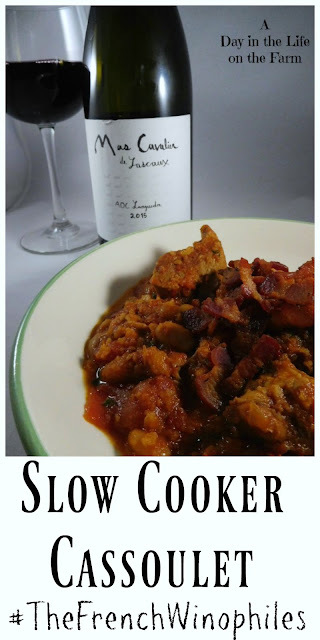 The wine and the stew were average on their own and brought to the next level when shared together. Cut the ribs into chunks, season with salt and pepper and set aside. Place the olive oil and bread crumbs in a large skillet over med high heat. Cook and stir until bread crumbs are golden brown, 4-5 minutes. Remove to a small dish and set aside. Place the bacon into the skillet and cook until crisp, 4-5 minutes. Remove to a paper towel lined plate. Set aside. Add the seasoned pork to the bacon fat in the skillet and sear until browned on all sides. Remove and place in the bottom of a slow cooker. Add the onions to the skillet, season with salt and pepper and cook, stirring occasionally until golden brown and softened. Add the wine and tomato paste. Cook and stir until reduced by half, scraping up any browned bits stuck to the bottom of the pan. Add the tomatoes and chicken broth. Heat to a boil, roughly chopping up the tomatoes. 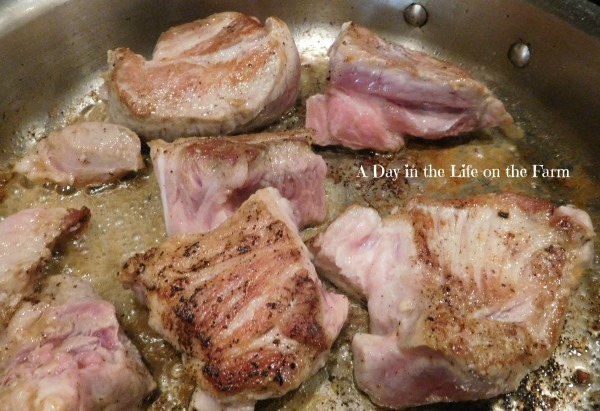 Pour over the pork in the slow cooker. What a great recipe and pairing, Wendy. I can't wait to try this. Mmmm the magic of a good pairing! And I so love a good cassoulet! This was the first I ever enjoyed. It won't be the last. I thought that wine looked familiar Wendy. I bet it was a terrific pairing with your Cassoulet (which also looks fantastic)! Thanks for sharing! Thanks Martin. I was happy to be able to give another nod to #MadeinFrance.